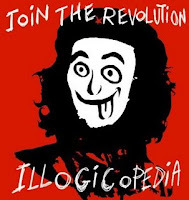 Illogiblog - The Illogicopedia weblog: Illogicopedia banners - show your support! Illogicopedia banners - show your support! This is a reminder of the fact you can add specially produced Illogicopedia banners to your website or forum. Feel free to link to Illogic too, and just maybe we'll make your site a featured webpage. The (Fear) Arousing Hallowe'en Fables!